The estate comprises 2 individual houses on a garden planted with many fruit trees. The first house has 2 bedrooms, one air-conditioned and the 2nd bedrooms with fan, 2 bathrooms, 1 large veranda-dining room, satellite TV lounge, kitchen, 1 veranda, 1 washing machine. 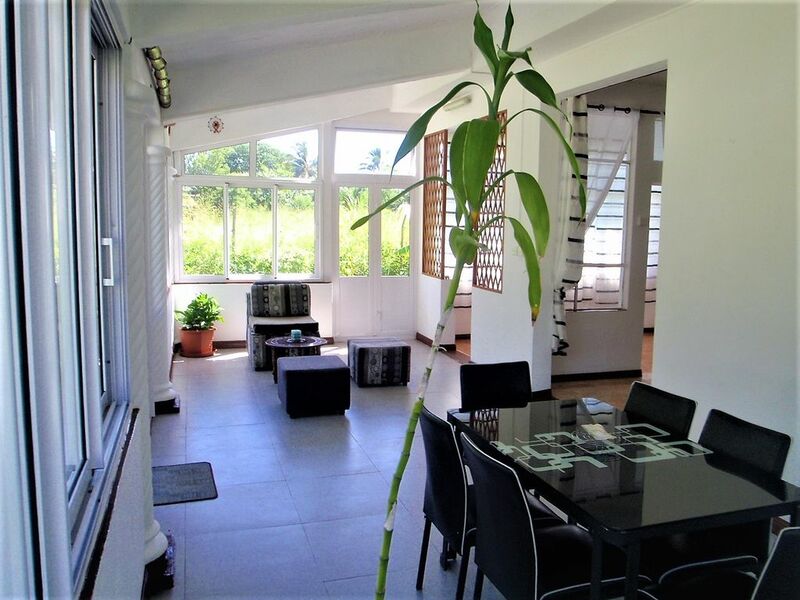 The second house is that of your hosts .The quality of the services is for me one of the best quality / price ratio of the island .Ocean 5 minutes .All the amenities are at your fingertips: (self service, bakery, shop, restaurant , post office, ATM, gas pump). The half board is 600 Rupees per person. FREE WIFI. sheets, towels, tea towels are changed every 3 days, bins emptied every day. The house is delivered clean on arrival but you do not have to clean before leaving, your hosts will take care of it. Parc François Leguat (giant tortoises endemic free).